Mudeford Quay is an un-spoilt working Quay and is the heart of Christchurch Harbour. The Quay is a safe haven to learn and try watersports from Windsurfing to Sailing. A large green area is perfect for picnics, ball games and kite flying. 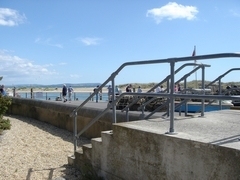 On the Quay you will find a great children's play park, an RNLI lifeboat station, locally famous fresh fish stall, ferry across to Hengistbury Head and Christchurch, a Cafe and The Haven House Inn. Fishing and sightseeing boats leave from the Quay to destinations all over the Solent. A promenade leads to the Blue Flag Avon Beach.